Free Practice 2 for the Spanish Grand Prix saw a number of drivers slipping and sliding, and even spinning, when trying to go for a qualifying run on the super soft Pirelli tires. The result was that many of them did not improve their lap times set on the soft compound tires, or barely improved the times. 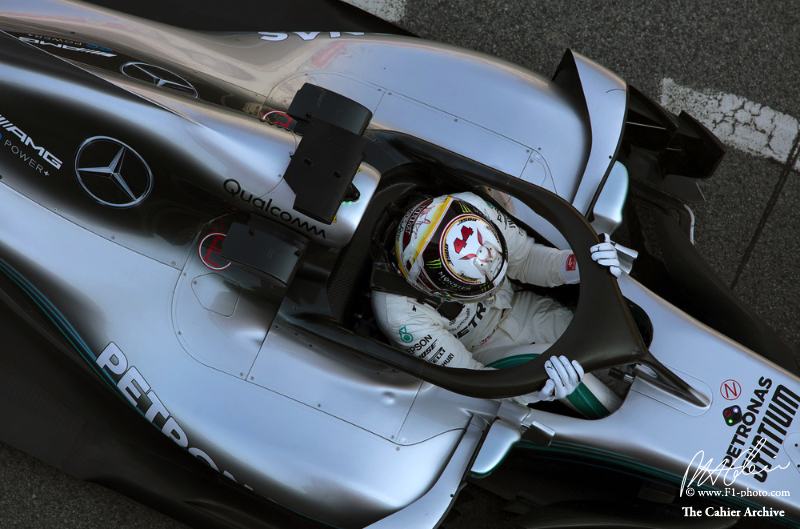 Fastest of the slippers and sliders was Lewis Hamilton who clocked his best time on the soft compound. The line-up for the weekend was: Mercedes – Hamilton and Valtteri Bottas; Ferrari – Sebastian Vettel and Kimi Raikkonen; Red Bull TAG Heuer – Daniel Ricciardo and Max Verstappen; Force India Mercedes – Sergio Perez and Esteban Ocon; Williams Mercedes –Lance Stroll and Sergey Sirotkin; Renault – Nico Hulkenberg and Carlos Sainz; Toro Rosso Honda – Brendon Hartley and Pierre Gasly; Haas Ferrari – Romain Grosjean and Kevin Magnussen; McLaren Renault – Fernando Alonso and Stoffel Vandoorne; Sauber Ferrari – Marcus Ericsson and Charles Leclerc. Bottas went quickest in FP1 with a time of 1:18.148 on the soft compound Pirellis. The other two slicks available for the weekend were the medium and the super soft compounds. Grosjean and Magnussen were the first out in FP2 as the green lights came on at pit exit. The ambient temperature at the start of the 90-minute session was 74 degrees Fahrenheit (24 degrees Centigrade) and the track temperature was 108 degrees Fahrenheit (42 degrees Centigrade). Grosjean’s session lasted just five minutes before he spun and got stuck in the gravel at Turn 7. Vettel, on the soft tires, set the pace early on with his 1:19.421. But then Verstappen, also on the softs, knocked in a 1:19.050. Vettel responded with a 1:19.074. Verstappen improved to a 1:18.699 as Hamilton moved into second. Then Bottas beat Hamilton with his 1:18.882. But Hamilton came back with a 1:18.259 twenty minutes into the session. Next, Ricciardo slotted into second. After nearly half an hour on track the drivers headed to the garages to get their cars ready for their qualifying sims. Hamilton, Ricciardo, Verstappen, Raikkonen, Bottas, Vettel, Magnussen, Perez, Ocon and Alonso were the top ten. Bottas was one of the first out on the super softs. He had a messy lap and could only manage third with a time of 1:18.644. Hamilton also had a messy lap on his set of supers and did not improve his time. Then Verstappen ran wide on his qualifying lap, so he did another one and he got down to a 1:18.533. Vettel, Raikkonen and Ricciardo had difficulties on their super soft runs as well, and did not improve or only by a little bit. Then Raikkonen went off at Turn 7, and then coasted back to the pits with what looked like a blown engine. With all that slipping and sliding, the top 10 with just over 30 minutes remaining were: Hamilton, Ricciardo, Verstappen, Vettel, Bottas, Raikkonen, Magnussen, Vandoorne, Perez and Ocon. Then it was on to long runs on worn tires. A few more drivers had a go – most noticeably Grosjean whose car had been returned to the pits – with the final top 10 ending up as: Hamilton, Ricciardo, Verstappen, Vettel, Bottas, Raikkonen, Grosjean, Magnussen, Vandoorne and Perez.